Hi, I’m Maddie! I’m currently an apprentice engineer at Aston Martin, with the end goal of working in motorsport. In my spare time I play scrum half for the Towcester Roses Ladies Rugby team, and I’m generally quite a crazy talkative person, as my teammates will know. 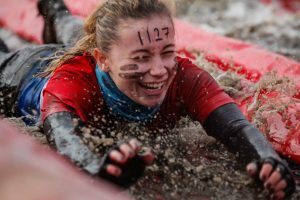 I love doing work for charity, and taking part in mud runs and mental challenges to face my fears. Mixing this together to raise awareness of SWAN UK is something I’m very excited to do next year! What activity are you doing to raise money for SWAN UK? I will be taking part in the Spring Wolf Run (one of four this year). This is a 10K muddy obstacle course run. These things usually involve open water swimming (my biggest fear), climbing nets, crawling in mud, and a lot of trying to keep warm. My friend’s mum, Emma, has been supported by SWAN UK as her daughter Kaila has a syndrome without a name. I have seen what it is like for them as a family to have to deal with the challenges that comes with. It’s very important that I can help support in any way I can, so raising money and awareness of SWAN UK will hopefully show in just a small way how much I want to help! I have done a few other mud runs and an open water swim over the last two years for another charity. How much are you aiming to raise for SWAN UK? My aim is to hit around £300 for SWAN UK. I don’t generally train for this sort of thing, as it’s not normally about the time for me. I like to challenge myself, and get myself in difficult situations to see how far I can push myself, and doing very little training certainly helps with that! However, I think playing rugby will definitely help me get used to the rolling around in the mud, and help me keep up my general stamina. For things like this, it always helps to have people around you or on the sidelines to cheer you on. However, a lot of times I use my own mind to do it. I make myself think about the challenges people face every day when they are affected by an illness or in this case a lack of diagnosis. When you think about things like that, a run of this size seems incomparable, so you keep going. What do you think the hardest moment will be? The hardest moment for me most of the time will be the open water swim, as it is one of my biggest fears. Plus, keeping warm is always a huge problem on the way round. What will the best moment be? The best moment is the finish, knowing I’m doing it for a great cause, and knowing that I’ve faced my fears and made people proud. Definitely! I’m going to keep trying to raise money for charities until I can’t do these runs anymore, and even then, I’m sure I’ll find something new to do! Yes, there’s no feeling like completing something as tough as this. It shows that not only are you physically strong enough, but mentally too. There’s no other feeling like it, when you are frozen to death at the end but you can look back and say that you’ve done a challenge like this. Above all else, everything you do is for charity, so it’s a win win!